TO CHEW ON: "But Gehazi, the servant of Elisha, the man of God, said, 'Look, my master has spared Naaman this Syrian, while not receiving from his hands what he brought; but as the Lord lives, I will run after him and take something from him." 2 Kings 5:20. The last character in the Naaman story is Elisha's servant Gehazi. He isn't confronted with Naaman's leprosy, as the characters in the earlier instalment were, but with his boss's reaction to Naaman's offer of gifts. I can just see Gehazi as Naaman returns to Elisha, loitering in the background, eyes glittering as Naaman's servants unpack the beautiful clothes and the sacks of coin. Then watch his expression change when Elisha refuses them all. He wants that stuff, oh, how he wants it! And so he makes a plan. He runs after Naaman and tells him that Elisha has received guests, now needs some things, and asks for a modest two outfits and a sack of silver. Foolish Gehazi. Do you not know that your master is in touch with the One who can not only see your motives and actions, but can reveal them to him? 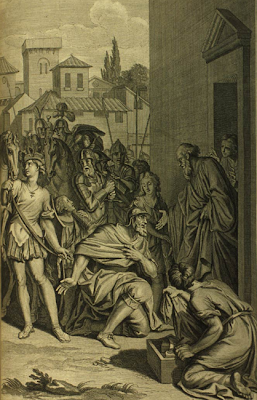 Elisha confronts Gehazi with what he has done and bequeaths on him and his family the leprosy that had infected Naaman. 1. Being around the things of God and the people of God doesn't change our hearts. Gehazi served the man of God but he wasn't a godly man. Each of us needs to come to God personally and have a personal relationship with Him.